September is National Yoga Month! You've probably heard about the many of benefits of regular yoga practice, but did you realize that yoga is great for kids, too? We don't need to tell you that life in the 21st century can be busy and stressful for everyone in the family. Between the rush to and from school, work, home, and extra-curricular activities, kids and their parents are frequently on the go. School age children face the stresses of homework and peer interactions, while parents feel the pressure of providing and caring for their family. Yoga is a healthy habit. Exercise is important for kids of all ages, and helping them find a form of exercise as a young child that they can continue through all stages of life is very valuable. Yoga is non-competitive and teaches self-acceptance. In yoga, we often remind participants that their bodies are different; different bodies do different things and all of them are okay. No one "wins" at yoga, and it also teaches kids to accept and cherish themselves as they are. Yoga teaches tolerance. "Namaste" literally means "the light in me sees the light in you". During yoga, kids learn that all living beings are to be cherished and respected. Yoga helps kids to focus. In a world filled with constant distractions, kids can benefit from learning to be present, and to concentrate and focus on their breathing. Yoga teaches calming techniques and promotes mental and emotional health. Kids naturally deal with frustration by crying, shouting, or throwing tantrums. When they are taught to focus the mind and calm the body through breathing, kids have better coping tools. Children who learn to relax and be still are better able to handle the stresses and pressures of life. 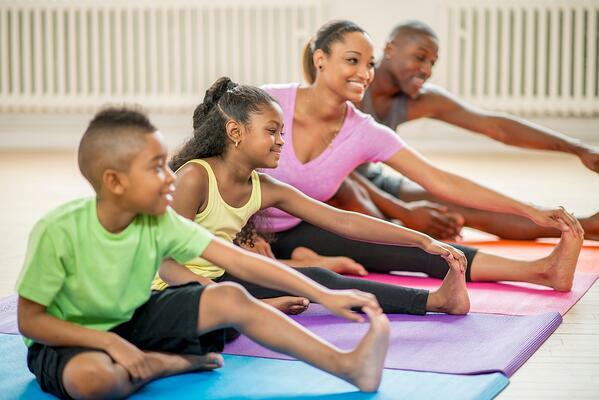 One of the best ways to introduce children to yoga is to participate in a family yoga class. It's an opportunity for your family to come together and practice the techniques of relaxation, flexibility, coordination, and strength that yoga encompasses. We offer family yoga at our Folsom and Elk Grove clubs, click on the links to find a class for your family. At Cal Fit, we're celebrating Zentember in a variety of ways. Ask an employee or check our events page and social media for more information.